Shaded Relief Map of Io. This is an impressive 1987 U.S. Geological Survey map of Io, the innermost moon of the planet Jupiter. This relief map depicts the many peaks, volcanoes, plateaus and mountains on the surface of the most geologically active object in the Solar System. The North Polar Region and the South Polar Region on polar stereographic projection are featured in the upper left and right quadrant respectively. The map also contains several notes along with an index of relief and features in the three maps. This map was based on images from Voyager 1 and 2. 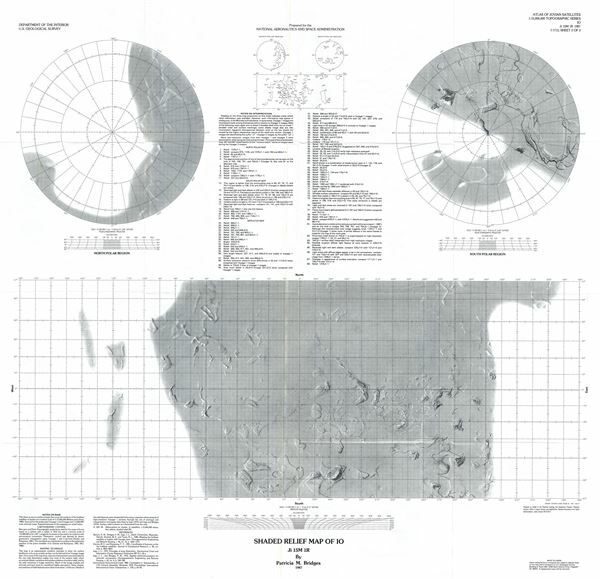 This map was prepared for the National Aeronautics and Space Administration and published by the U.S. Geological Survey as Atlas of Jovian Satellites Topographic Series Ji 15M 1R map I-1713 sheet 2.